The OctoDome® nxt: Extra Small Kit is a very powerful tool for achieving a distinctive look when used alone or with other lighting products. The small size and deep profile (approx. 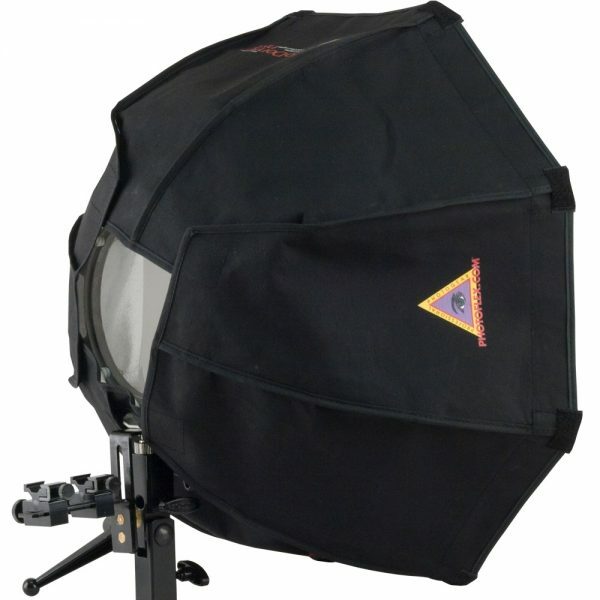 18 inches across and 9 inches deep) makes it perform like a traditional parabolic reflector. With its removable face and baffle, this kit can be used to achieve three distinct lighting styles for key and hair lighting applications: Specular (remove baffle and face), Softened (use baffle only), Diffused output (use both baffle and face). The OctoDome® nxt is built with our heat resistant fabric and can be adapted, with optional speed ring, for use with our StarLite® tungsten fixture with lamps up to 500 watts.